In a bid to continue to impact positively on the society and deepen effort to support sports and athletes in Kwara State, the Kwara State Internal Revenue Service (KW-IRS) fulfilled its pledge to the Kwara State Sports Council by presenting cheques to all Team Kwara medalists from the 19th National Sports Festival held in Abuja from 6th-16th December 2018. 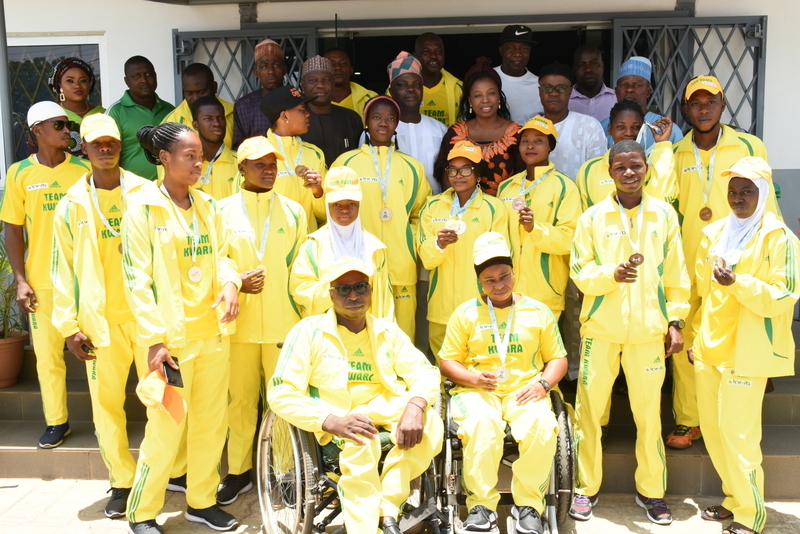 Earlier before now, KW-IRS donated kits to the Team Kwara Athletes at the Kwara State Stadium Indoor Sport Hall in November 2018 where the Chairman of the Service promised to reward any member of Team Kwara that wins a medal at the 2018 National Sport Festival. In a brief presentation ceremony at the Corporate Head Office of the Service on 12th April 2019, Oyinloye Taiye who won gold and silver medals received N800,000 while silver medalists Ambali Risikat, Rofiat Abdulazeez, Muslimat Abdullahi, Soliat Usman, Taofeeq Aminat got N300,000 each. Bronze medalists Bello Aminat, Muslimat Jadesola, Muslimat Abdullahi, Zakariyya Abdulrahmon Oloruntobi received N200,000 each. The Squash Women Team Comprising of Rofiat Abdulazeez, Soliu Oyindamola, Blessing Issac, Adeyi Odunade got N75,000 each while the Squash Men Team comprising of Oluwafunmilayo Gabriel, Abdullahi Hammed, Abdulrahman Oladipupo and Ismail Abubakar Damilola received N50,000 each for winning a bronze medal. Speaking at the event, the Honourable Commissioner for Youth and Sports Development, Mr. Muyideen Alalade expressed his profound gratitude to KW-IRS for redeeming its pledge. He also appreciated Team Kwara for making Kwara State proud by winning medals in the just concluded National Sport Festival held in Abuja. Presenting the cheques, Prof. Muritala Awodun, the Executive Chairman of KW-IRS ably represented by Mrs. Adenike Babajamu, Director Admin and Operation, said the rewards were in fulfillment of Governor Abdulfatah Ahmed’s administration to reward hardwork and excellence. She appreciated His Excellency and Members of the House of Assembly for increasing the Service’s CIP budget. “I want to thank you for your commitment, hard work and dedication that have produced some of the results that we are celebrating today. I also want to let you know that in sports, losing does not mean that you did not work hard. Experience is also part of victory, therefore, those who competed and did not make it; I celebrate you as heroes because upon your performances, the future lies. For those who made it, we are proud of you. We are happy that you have been able to make Kwara State proud”. The Director of Sport Council, Mr. Tunde Kazeem in his remarks appreciated the Executive Chairman for providing the sports kits used at the National Sport Festival and also for the sponsorship of Shukurat Aiyelabegan who is presently schooling in Ghana. He disclosed that apart from Delta State, Kwara State is the only State that has fulfilled its promise of rewarding the winners. In his closing remark, the Honourable Commissioner for Youth and Sports Development, Mr Muyideen Alalade appreciated the effort of the Service for rescuing the State from recession in 2015-2017 and its effort in promoting sport in the State.